If you have a Cuy, please help collect data so that we can learn more about them. Please also update if he/she has passed away, at what age and the causes if known. This will help us anticipate their health problems as well as educate the public about their special needs. No known health problems yet. Great idea, Charybdis! I can make this a temporary sticky. She's around 1 1/2 years. Very difficult to catch but good once you do. Great idea!! It would even make a great permanent sticky too! Feet double sized with 6 toes on each front foot, 5 toes on each back foot. 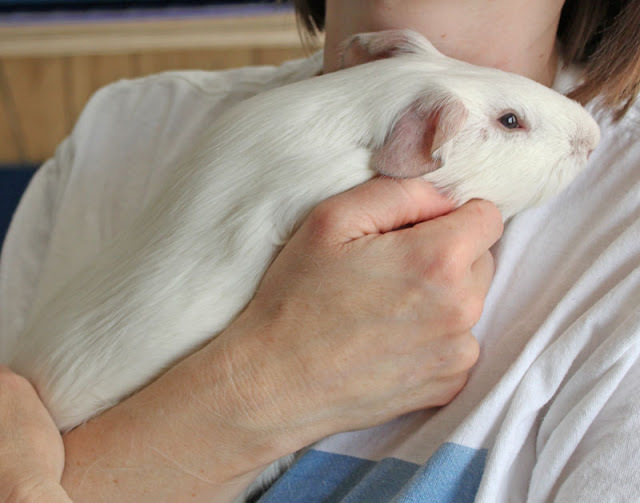 Extremely skittish when arrived, chose his forever mom (a volunteer) and totally relaxes when she holds him. Had some foot issues upon arrival, likely poor husbandry. We had him neutered because we had NEVER seen anything like him and didn't want anyone to ever have chance to breed him. Photo taken July 7, 2010 sitting next to a normal sized female (900-1000 grams). mmercedesmom, can I add your pics to this thread? 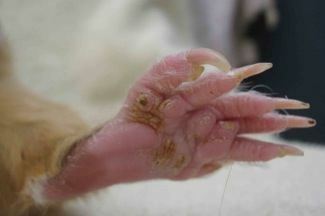 I'd also like to include a couple on one of the foot pages with clear information that this is a genetic abnormality. I don't want pet stores trying to sell this kind of guinea pig! Of course, Lynx, use whichever ones you would like. 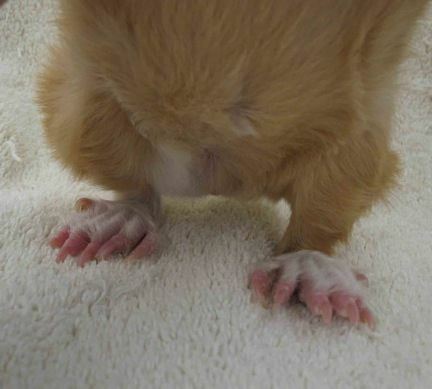 I have a few more of his front feet in the same Picasa album online too. More pics could be helpful. If you have a link to your album you want to post or email me, that would be great. 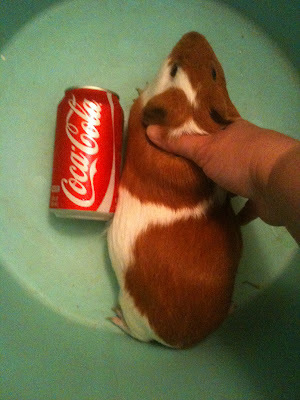 I'd really appreciate if someone has a good picture whereof you can see the size difference between a normal guinea pig and a cuy. Even happier I'd be if I can use it in my "basic guinea pig info for vets"-product. I have a couple. I don't know if they would work. One is in the first page Cuy gaining weight and another is in Show your cage 4 the last page. 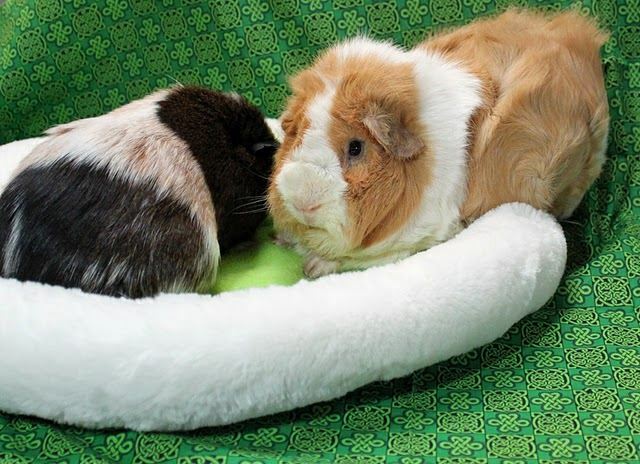 How do you determine if you have a cuy or just a fat/long "normal" guinea pig? 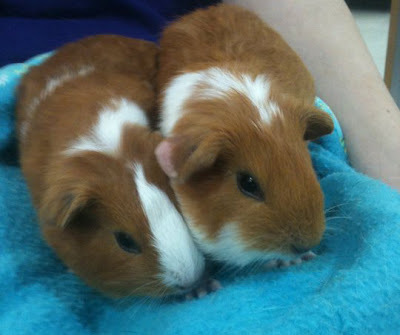 These Cuy are about twice the size of normal guinea pigs. Many of them have extra toes. Most are really not tame. They usually have large feet and ears. Once you have seen a couple they become easy to distinguish. The one in the donut bed with Star was taken 4 months later. They were abandoned in a Petco, had been up for adoption for 3 months at the time we took them in. Super skittish and had URI symptoms. Very hard to catch, even after months of intensive handling in foster care. No known health problems once recovered from URI. 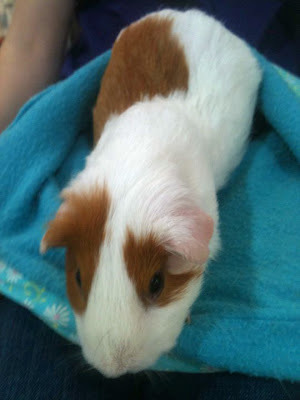 Transferred to Arizona's Piggie Poo Rescue and subsequently adopted. These pics were when they first arrived and weighed "only" 1450-1500 grams. 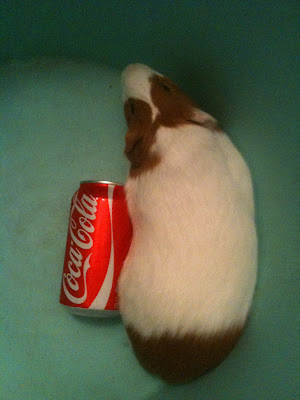 That is a 12 oz can of Coca Cola next to them for size reference. Dark eyed white American with a touch of red on top of head. Hard to catch, but settled once held. Better after intensive handling. Adopted out as companion to a normal sized sow, February 2011. Photo taken December 2010 next to an 850 gram adult Skinny sow. Private party surrender, originally purchased at a Petco, along with "husband" who was also a cuy. No weights known, but still growing. All 3 transferred to Arizona's Piggie Poo Rescue, April 2011. Photos taken in a cuddle cup just 2 weeks after pups delivered. Kahoots (pet store) in Poway asked that we take her in because of her extreme skittish behavior and blindness. Last known weight 1650-1675 grams. Blind or very limited sight. Lives with me as Sanctuary pig with a neutered boar of mine. Very hard to photograph! Photo with Charybdis holding Jem, at approx 6 months old. This is how we trim nails too, it's a two person job. She is very strong and has a tendency to try to bolt suddenly. We should take some pictures of her feet on Wednesday (if we can get her to hold still). How do you pronounce (cuy)? I've never heard of this before. Is it a genetic problem or are they being bread to get bigger piggies? Is it common?